The Americans with Disabilities Act (ADA) was passed July 26, 1990 and became effective on January 26, 1992. It is landmark federal legislation designed to open up services and employment opportunities to the millions of Americans with disabilities. View a full history of the ADA. The ADA requires that all washrooms, whether they're newly constructed or renovated, must be usable by people with disabilities. Design guidelines are continually being updated and modified, which presents a significant challenge to building owners and installers. ADABathroom.com provides the latest guidelines specific to public restrooms from the ADA 2010 Standards for Accessible Design. 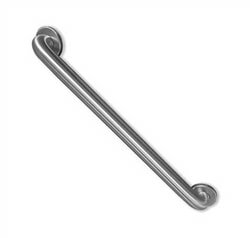 ADA regulations specify the physical requirements of grab bars as well as the locational requirements. They do not specify how they are to be installed, which is equally important for safe use. Professional installation is highly recommended. The ADA regulations specify dimensional, locational, and load bearing requirements for shower seats. Installation is of critical importance and in-wall backing is required for safe use. 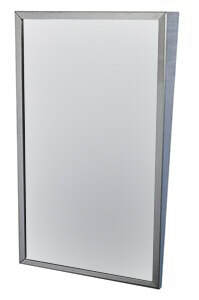 The ADA mirror requirements insure the reflective surface is accessible to wheelchair-bound individuals. 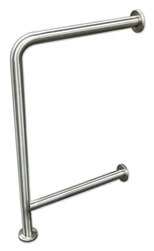 This is typically achieved through a fixed tilt frame or adjustable brackets. The ADA regulations specify height requirements for installation.